St. Louis Country Club ("SLCC") is not ranked in the top 100 courses in the world; nonetheless, it is a great place to play golf. 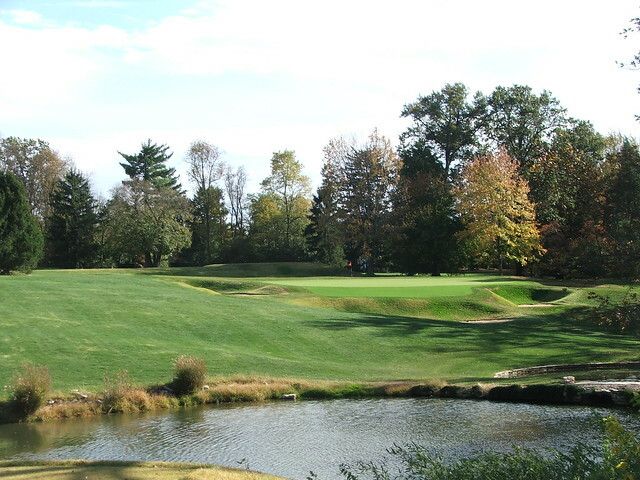 Located outside the city, in the affluent enclave of Clayton (Ladue), SLCC is a real treat to play. Notice their distinctive logo on the scorecard, which features a polo themed mallot and interlocking horseshoes. Also, the back of the card has an image of C.B. Macdonald with his caddie, an iconic pose of the maestro which is featured in an oversized painting of him that hangs at The Links Club. St. Louis Country Club has the distinction few golf courses in America can claim: It was designed by the father of golf in this country, Charles Blair Macdonald, whose National Golf Links of America set the standard for greatness. Macdonald only designed a handful of courses in addition to St. Louis and the National. These include The Creek, Sleepy Hollow, Piping Rock, the Greenbriar's Old White Course and the historic Chicago Golf Club. As was almost always the case with C.B., Seth Raynor was in charge of actually building the course, which was completed in 1914. Macdonald and Raynor almost always used "prototype" holes on other courses and St. Louis Country Club is no exception. It has a brilliant collection of holes patterned after some of the greatest holes in the world, originating from the British Isles. Coincidentally, like at two other Macdonald designed courses, there is a full sized polo field in front of the clubhouse that also serves as a driving range. Unlike the fields at Chicago Golf Club and the Piping Rock Club, this one is still in use. It is probably more than a coincidence that C.B. was associated with these monied clubs. Given his patrician nature and his associations with wealth, he was more likely to be called into elite communities such as this one to practice his craft. Although jets weren't yet invented, C.B. Macdonald was one of America's original jet setters and traveled in circles of people comfortable with polo and yachting. 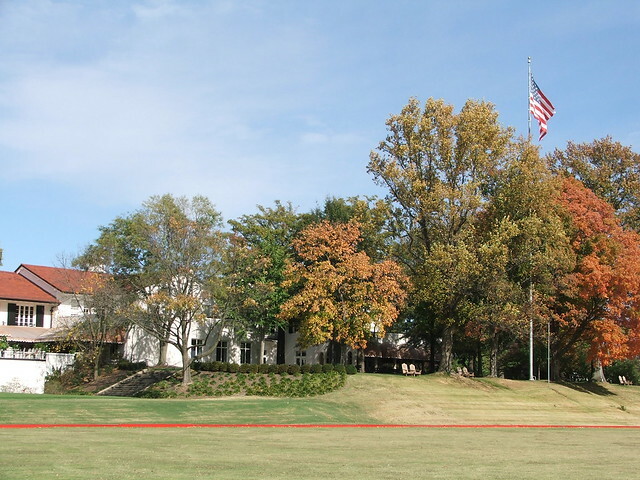 St. Louis Country Club hosted the U.S. Open in 1947 and the U.S. Amateur in 1921 and 1960. I suppose it doesn't host big tournaments anymore because it is only 6,534 yards from the tips (par of 71). Although the property has nice rolling terrain, Macdonald liked to start with an easy hole and the 394 yard first hole, "Preparatory," is a flat and benign starting hole that eases you into the round. In an oddity, the next two holes are both par threes of the same length. They measure 213 yards each. The second hole, "Double Plateau," is as advertised. Loved it. The third has to be the hardest rendition of an "Eden" hole I have ever seen. It plays uphill over water to a difficult-to-hit green. 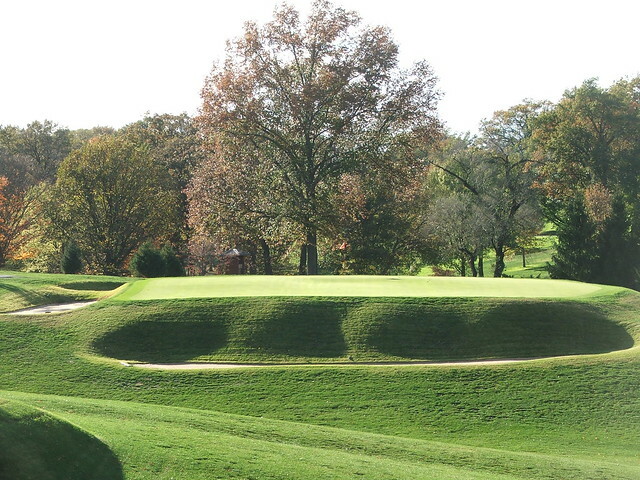 The book The World's 500 Greatest Golf Holes ranks the third hole at St. Louis among its entries because of the "phalanx" of bunkers and the difficulty of the green. I particularly like the "Punch Bowl" fifth hole, as I generally do all Punch Bowl holes. I just think it's an interesting way to design a hole. This 508 yard par five doesn't disappoint from tee to green. Unlike my favorite Punch Bowl hole at the National Golf Links, which plays up a big hill, the shot to this Punch Bowl is blind and plays down a hill and is situated in front of a small stream. The sixth, named "Blind" is the start to a relatively easy part of the course. It is a 359 yard par four which features a blind tee shot, and depending upon where your ball lands, you will more-likely-than-not have another blind shot to the green, albeit a pitch shot. 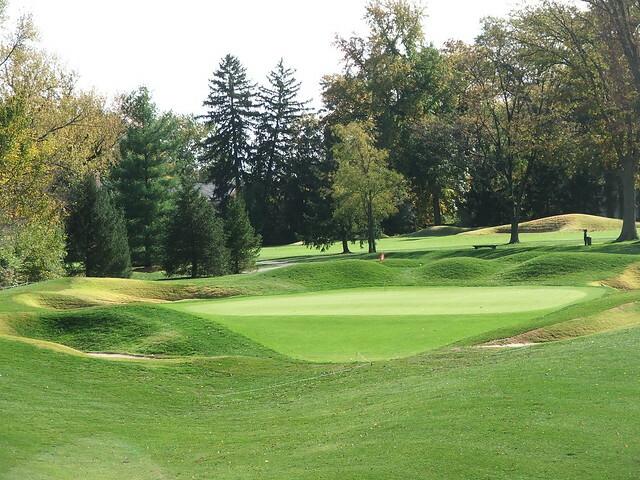 The seventh, a prototype Short hole, smartly named "Shorty," is a beautiful rendition of this classic hole with a horseshoe green similar to, although not as severe as, the twelfth hole at Forsgate Country Club. The classic par three "Shorty"
Every hole at SLCC is genuinely interesting, and I can't describe one as weak. The eighth is a "Cape" hole. Although there is a meandering stream that snakes around the right side of the hole, the water really doesn't come into play. The front nine finishes with a tricky par five named "Ladue." The green slopes away from you, which makes it a demanding approach shot, and, like all the greens at St. Louis, is lightning quick. SLCC has five par threes. The twelfth, "Crater" hole, is another demanding one at 178 yards uphill. 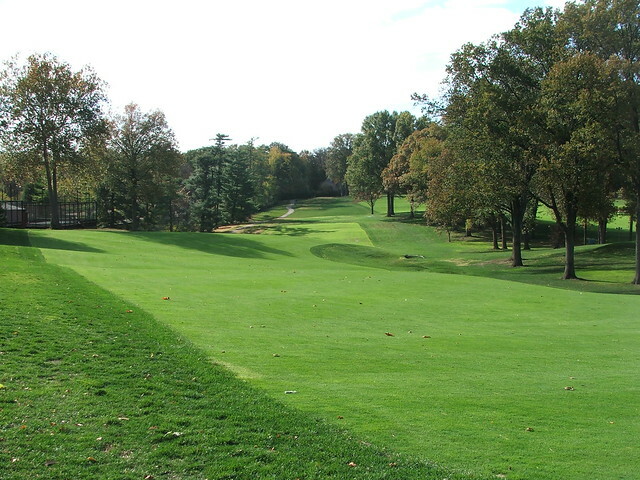 Another long par three at St. Louis, the 12th, "Crater"
The thirteenth is the #1 stroke index hole and plays 601 yards with a fairway that slopes left to right and features an unfair back-to-front sloping green. 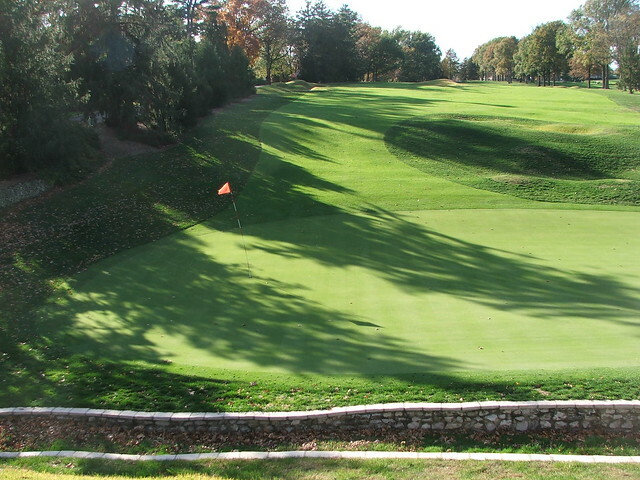 St. Louis's "Redan" hole, the sixteenth, is actually a reverse Redan and slopes left to right and is angled away from you with a massive bunker on the right. The ability to fade the ball into the green is of paramount importance. The eighteenth, "Oasis," is the best and most demanding hole on the course in my view. It is a 412 yard par four that plays up a big hill. Your second shot will be blind to a big green that has some characteristics like a Punch Bowl. Also, the carry required and the bunker between the fairway and the green reminded me of the "Alps" hole at Prestwick. My photo is looking back and shows the canted nature of the fairway. Playing at St. Louis is a great day's fun. The ability to play a classic course in an idyllic setting is what golf is all about. St. Louis is an old money, conservative town and their namesake club mirrors the city. I thought New York was the epicenter of the world and had all the great golf courses? How exactly did St. Louis end up with an early world-class golf course designed by one of the greats? St. Louis has been an affluent place for a long time, going back to its roots as a Mississippi River gateway city. In addition to SLCC it has a collection of other wonderful courses including Bellerive and Old Warson, all clustered a few miles apart. At the time SLCC was built, St. Louis was the fourth largest city in the United States. A decade earlier the city had hosted both a World's Fair and, amazingly, an Olympic Games. As such, the suburbs in the Western part of the city have been here a long time and were built by people with money. The houses surrounding the course are quite well-heeled and reminded me a bit of those surrounding the Valley Club of Montecito, which is reflective of how prosperous this part of St. Louis is. St. Louis has always punched above its weight relative to other cities of its size. It is the corporate headquarters of Anheuser-Busch, Energizer, Edward Jones, Monsanto and Emerson Electric and formerly of TWA, McDonnell Douglas and several large banks. In 1927, when Charles Lindbergh needed money to fly solo across the Atlantic, at the suggestion of the local Chamber of Commerce, he went to members of the nearby St. Louis Racquet Club. They ponied up $15,000, which was the sum total cost of his plane; in return, he named his plane the “Spirit of St. Louis.” Along with the $24 the Dutch paid for Manhattan, it has to be one of the best values per dollar spent of all time. I had a Bud, which I don't really like, at the halfway house, but hey, this is their hometown and I always go local when I travel. The bratwurst there was fantastic, as you would expect in the Midwest. I have read that August A. Busch started the nearby Sunset Country Club after he was rejected for membership at SLCC. He'd be happy to know that rather than being considered crass mercantilists, many of his ancestors have now evolved into "old money" and play at SLCC. It is unsurprising that they are pretty much an all Anheuser-Busch shop. Missouri is the "Show-Me" state, and SLCC shows that it is a worthy of being included among the world's great courses. What was the clubhouse like? As elegant as NGLOA and other CBM courses? Asking if any clubhouse is as elegant as the National Golf Links is like asking if any women are as elegant as Grace Kelly! There is only one. However, it is a very nice clubhouse worthy of the neighborhood and of CBM. There is also a bench dedicated to CBM near the putting green, but surprisingly no statue of Charles anywhere to be found. The locker rooms at Chicago Golf and NGLA are better. SLCC wouldn't let in the CEO of ATT/SBC in while the company was still in STL. It pissed the guy off enough that he moved the Company and 1000's of jobs out of town. Everyone in STL who doesn't belong there hates the club and its membership. However, it's a fun golf course. ST L is SUCH a good course..
First, that is an extreme exaggeration that "everyone in STL who doesn't belong there hates the club and its membership"
Unlike clubs such as The Golf Club or Peachtree, many members of other private clubs in St. Louis have had an opportunity to play St. Louis CC and it does host USGA qualifiers and other occasional local tournaments. Second, I believe that it was a member of the Anheuser family that was not granted a membership to St. Louis CC and thus began Sunset. Finally, St. Louis CC is in Ladue. Clayton is an entirely different city both geographically and administratively, although they are neighboring cities. It can get confusing as St. Louis City is not in St. Louis County (in fact is in not in any country - one of the few cities in the US to not be in a country), and St. Louis Country is comprised of over 70 different cities and some unincorporated portions. But these comments are very minor. You write-up of this hidden gem is very good and very accurately describes the course. Just a slight correction for your piece - there is another C.B. Macdonald course with a polo field - Onwentsia in Lake Forest, IL. The polo field is now the driving range, but previously George S. Patton, of WWII fame, stabled his polo ponies there while stationed at nearby Fort Sheridan. Played SLCC this week. Loved the variety of golf holes with great greens (thought the par-5 15th was the coolest of them all), fun bunkering, a superb setting... might not be Top 100 but is one worth playing. A very fun, interesting golf course, that would benefit tremendously from further tree removal. I use to caddie at St. Louis CC in the middle '60s. I remember caddying for the likes of Otto, Poe, Griesedieck and playing on the course on Mondays when it was closed. It was a fantastic experience that I will always remember, especially carrying double bags for 36 holes during tournaments. The layout was quite demanding for both the golfer and caddie being full of hills and dales. I caddied at St. Louis CC from 1958 to 1966. 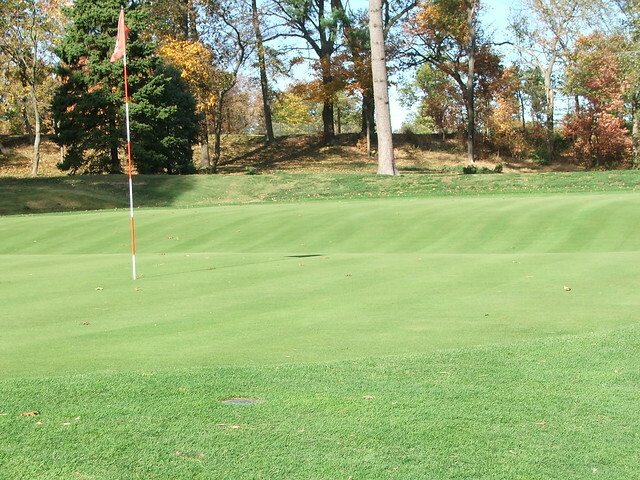 I visited St. louis and played the course about 8 years ago. They moved the green on #5. It used to be a two level, elevated green that was beyond the stream. It was a harder hole then. I caddied for J.S. McDonald Sr. and his wife every Sunday for quite a while. Fabulous people. Also Ellen Conant, Sam Davis Jr. (who could really play)and many others. Senitor Simington played there a few times. I remember watching the golf carts unload from the delivery trucks to replace us. The members were kind enough to let us "fore caddie" for a few years rather than just send us down the road. Classy members.